Note 1: Like football games? Check out my reviews of Tecmo Bowl Japan, Football Frenzy, SEC Tecmo Bowl, and Tecmo Super Bowl College! Note 2: This game, an original XBOX game, was played on an original model XBOX360, outputting at 480P (this game will not function on any higher HD setting). The XBOX360 was hooked up to a 32-inch HD tv. 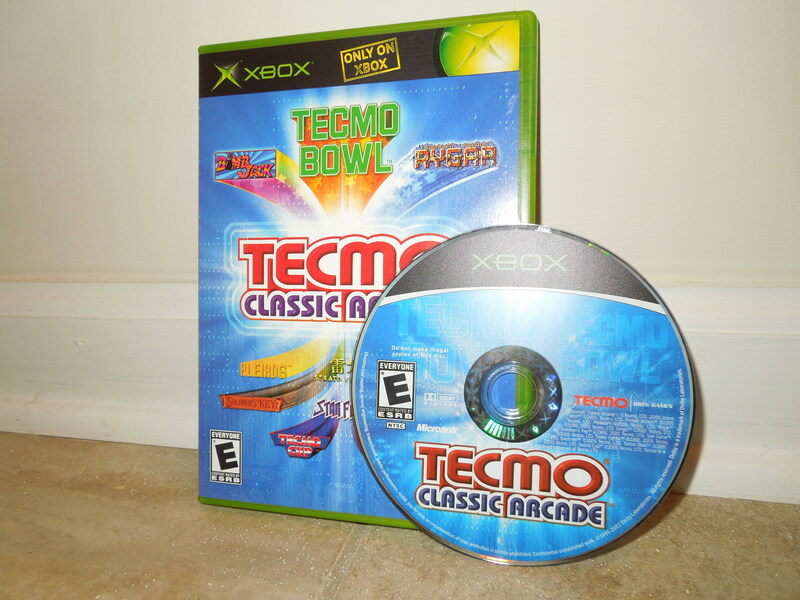 The Tecmo Classics Arcade disc, made for and playable on the original Xbox, will play on the XBOX 360 only if a hard drive is attached to the system and an appropriate update for the system has been downloaded via XBOX Live. Also, remember, I take all my own pictures, which explains why they’re not perfect – just as good as I could get! This original XBox game disc can be played on the XBOX360 if you have a hard drive and the proper updates. Quick History: Everybody knows about ‘Tecmo Bowl,’ the NES classic. Bo Jackson, Lawrence Taylor, Walter Payton. If you don’t know about it, there are dozens of sites on the Internet about it, as well as its popular sequel, Tecmo Super Bowl. This review is not about either of those games, but rather, their predecessor, TECMO BOWL ARCADE. Available in the arcades starting in 1988, this football game is, in my humble opinion, one of the best football games of all time. 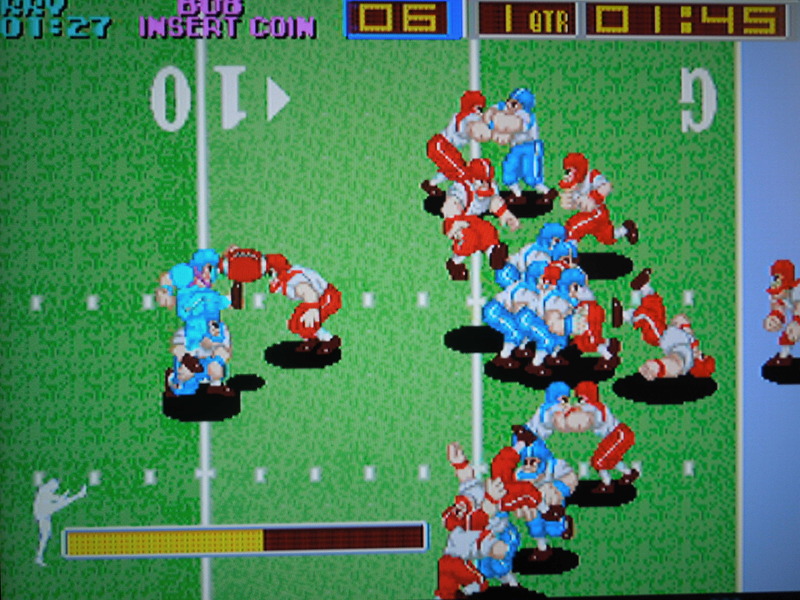 It is often overlooked in the Tecmo Bowl franchise, despite it being the first Tecmo Bowl game, because of the 1989 release of its NES counterpart. The game never received a port to the NES or SNES systems, nor any other home console, thus many people are ignorant of its very existence. 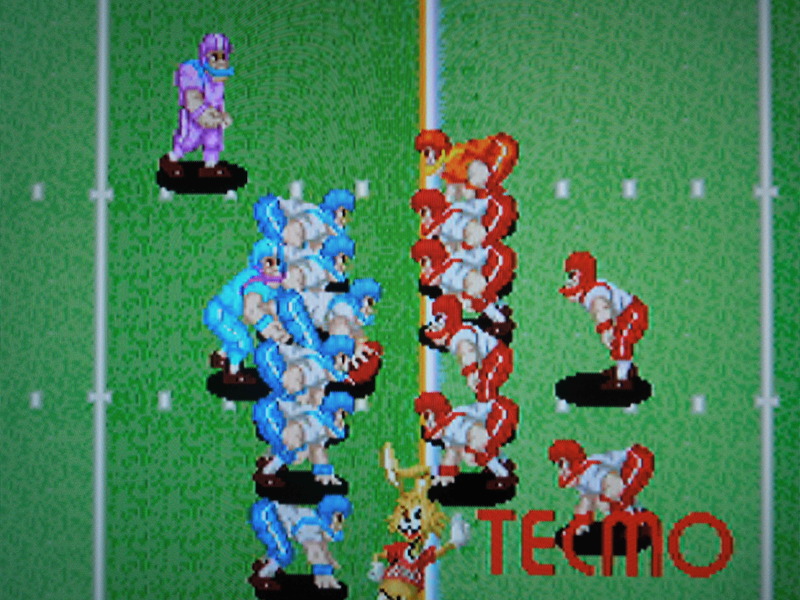 Today, the game is avaliable in a few different formats, but this review specifcally looks at TECMO BOWL ARCADE on the Tecmo Classics Arcade disc for the original Xbox console. It is an arcade-perfect port. No other games from that compilation disc are reviewed here. 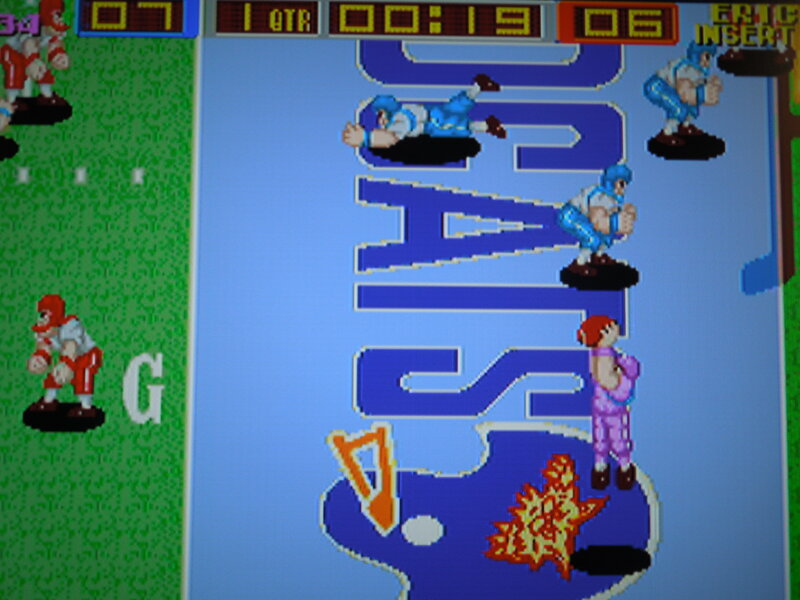 Gameplay: Tecmo Bowl Arcade features 2 teams only: the Wildcats (blue) and the Bulldogs (red). For some reason, this always makes me feel like I’m playing Kentucky vs. Georgia because the colors match the colors of the football teams from those universities. But I digress. 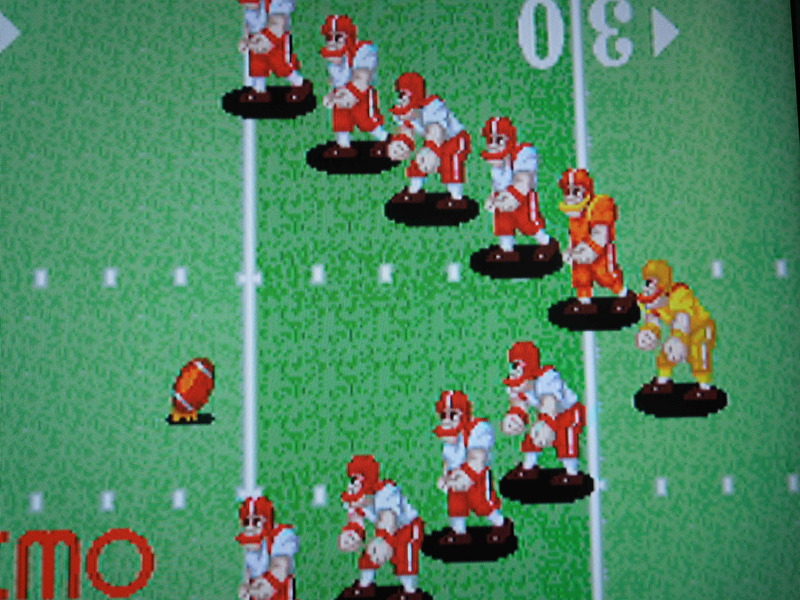 The game features 10 on 10, despite the fact that the rules of football require 11 players per side. That’s still one more player than NES Tecmo Bowl, which had 9 on 9. You play 4 quarters, with no overtime, so ties can happen. Both teams are identical in terms of how they play. In fact, all the players, regardless of whom you choose, move at the same speed. It’s not exactly quick, not exactly slow, but it works well. Player 1 wears all blue, Player 2 wears all purple, Player 3 wears all yellow, and Player 4 wears all red. Since this is an Arcade game that originally required quarters to buy ‘playing time,’ the X button ‘deposits’ your virtual quarters in order for you to play. 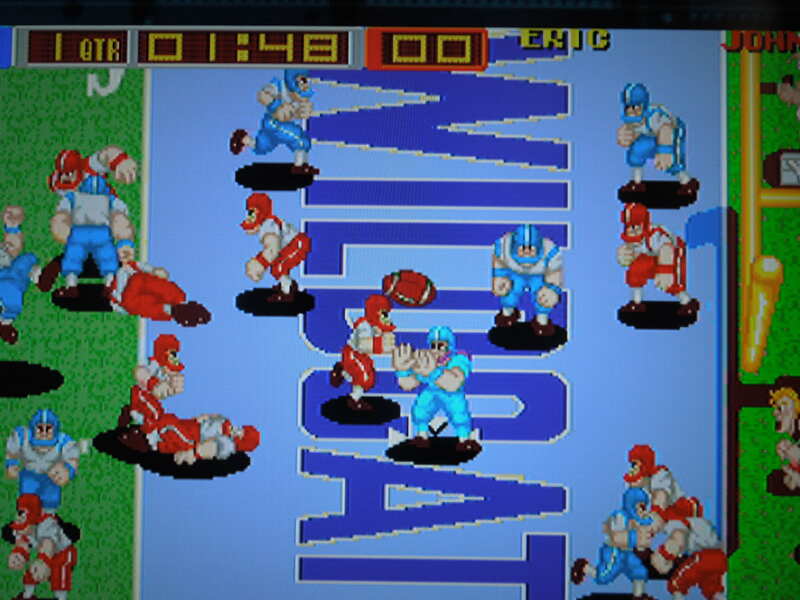 This game can accomodate 4 players, with Player 1 and 2 play being Wildcats (all blue and all purple players on the team), and Player 3 and 4 being Bulldogs (all red and all yellow players on the team). Unfortunately, you cannot play as the Bulldogs unless you have at least 3 controllers hooked up, nor can you play a VS match with a friend without 3 controllers, since controllers 1 and 2 always deposit quarters for the two Wildcats players. Offense: You do not have the luxury of choosing plays in this game. Instead, you run a hurry-up offense for the entire game. Go! Go! Go! On offense, your team will line-up in 1 of 4 random formations: 3 with the quarterback under center, 1 with the quarterback in the shotgun. No matter your formation, you always have 4 targets: a combination of wide recievers who run routes (some medium, some long) or a taliback and/or fullback to hand off to/pitch back to. As soon as you get tackled, you’re on to the next play immediately! As quarterback, however, you do have about 5 seconds to look at your formation (while your QB screams HUT! HUT! HUT! – you don’t have to wait the 5 seconds to hike the ball if you don’t want to) and press the A button to cycle through your targets (your chosen receiver or running back flashes – in co-op, the player who is not the QB selects whom to be). The player you choose to stop on will be the one you pass to/handoff to/pitch to, and you cannot change this after the play has started. So, if your receiver is covered, for example, you better make a play with your quarterback using his legs unless you want to throw a pick. Yes, it’s a shame you can’t just cycle through your receivers to find the open man after the play has started like in the NES version of Tecmo Bowl. Of course, you can always still throw to a covered receiver, and since you become the receiver (in 1 player mode) as soon as the ball is released, you can always use the jump button to try and out jump the man covering you and still make the catch. Being able to jump for long passes is a nice touch, by the way. Only two teams in this version: the WILDCATS (blue) and the BULLDOGS (red). themselves. Pressing A in the 5 seconds before the ball is snapped allows you to pick ANY player on defense – safety, linebacker, D-line. The A button, after the play has started, makes you jump, most useful when going for interceptions. The B button throws a diving tackle, and it’s awesome when you connect because you crush whoever is carrying the ball. If you ever let a receiver get behind you who has to jump to catch a pass, but you’re still close by, tackle him as he’s decending from the catch. You absolutely destroy him, making him spin 360 degrees and land at an awkward angle, complete with satisfying crunch for the collision. 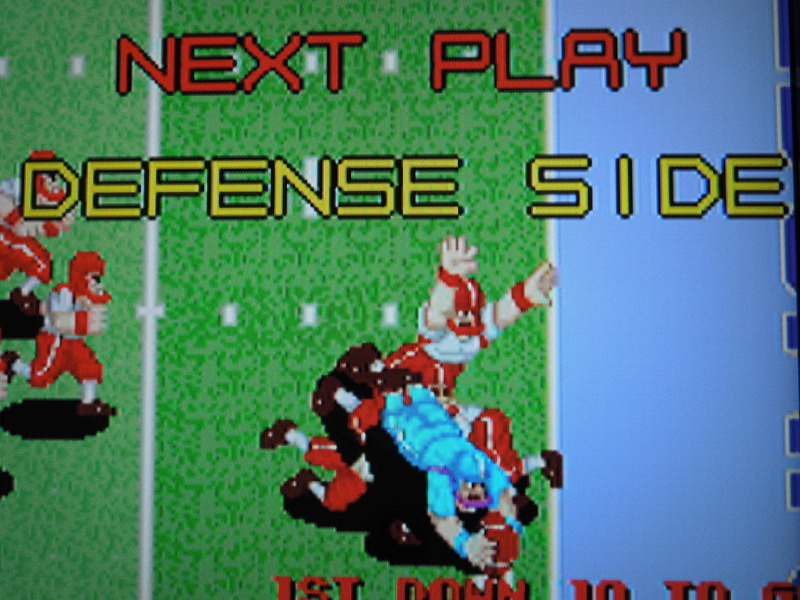 I’m pretty sure it would qualify as ‘targeting a defenseless receiver’ in real football and get you ejected, but hey, this is Tecmo Bowl Arcade – no penalties, injuries, time-outs, or ejections. Also, if you play 2 player co-op, on offense, the player without the ball can deliver crushing blocks by hitting B when close to an opposing player. If you’re accompanying your friend on his 50 yard run to the endzone, and an opposing team’s player manages to catch up, turn around and hit B to give him a HARD flying block. He won’t be getting up, and your friend will stroll in for 6. It’s one of the best things about co-op. Sound and Music: During the game, a very upbeat song plays, and an even more upbeat bit plays when you score a touchdown. They’re nothing special, but they work well to create an arcade atmosphere. 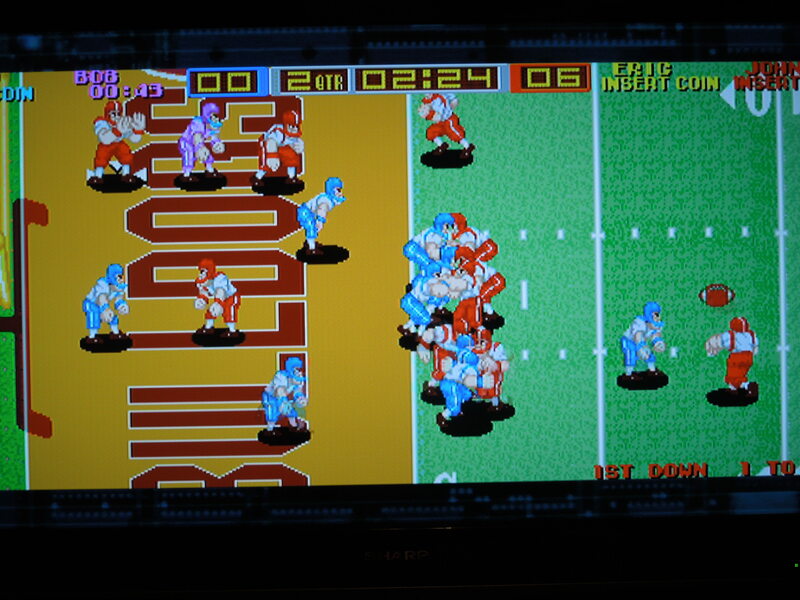 “First Down!” “Touchdown!” and “Interception!” all sound great as voice-overs and give the game that arcade feel. The sound bites are great. The smack of using the tackle (or flying block button in co-op) is magnificently bone-crunching. Interceptions have a nice sound effect, and there is even a sound effect for the ball being thrown. The computer will try to cover you for an interception often, so try to get open. Graphics: Great. The players are large and detailed, and occasionally you get to see various photographers, cheerleaders, referees, etc. along the sidelines. The endzones look great, with one displaying ‘Wildcats’ and the other ‘Bulldogs,’ complete with emblem. The shots of a raucous crowd are well done, too. Cartoony somewhat, but it works perfectly. High Scores: This game has 4 categories of high scores, and this Xbox version actually saves your stats, making its replay value higher than normal. After your game time has ended, you can enter your initials in 4 Top 10 lists, if you’ve played well – Intercepters, Defenders (Tackles), Runners, and Passers. Trying to beat your previoius games passing yards record or interceptions made record makes for a good time. 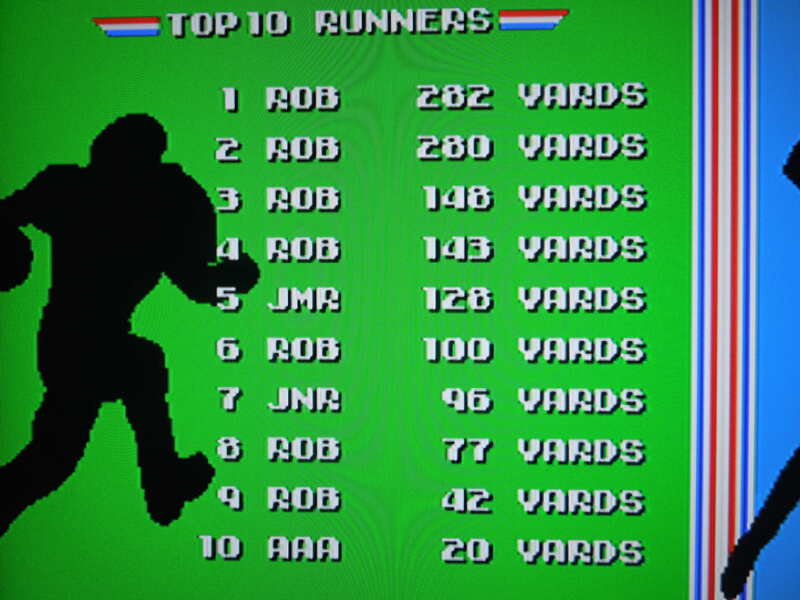 If you finish in the top 10 of rushing yards, passing yards, tackles, or interceptions, you can enter your initials in the high score screen – which will save even after you turn off the system. Laterals: For a simple game, you can execute some surprising trick plays because of the ability to lateral multiple times, as long as you’re behind the line of scrimmage. After the play has started, for example, you can lateral back to your pre-selected tailback (by pressing B) as if you intend to use him to run the ball. However, your quarterback has now become a receiver, and will run a route, allowing the running back to pass to him downfield. It’s fun to come up with different plays using the lateral. The computer will do this sometimes as well. Breaking tackles: Rotate the joystick in a 360 degree motion when opposing team’s players grab you. You’ll shake them off to make short gains into long ones. Usually, you’ll get swarmed under and go down if more than 3 tacklers grab you, but the faster you rotate, the quicker you’ll throw them off, and the more yards you’ll gain. This works great with the XBOX360’s control stick. Fumbles? Yes, you can technically fumble in Tecmo Bowl Arcade. The only way to do this is if you’re the quarterback and you lateral back to someone behind you (obviously). Once you pitch the ball, you become the player who will receive it (same rule if you throw a forward pass in a 1 player game). If you start moving before the ball gets to you, however, you’ll miss it, and the ball becomes live, open for the defense to jump on for a turnover – the defense cannot advance the fumble, only recover it. You cannot fumble in any other way, such as taking a hard tackle while carrying the ball. Co-op mode: If playing with a friend on the same team, you alternate who is quarterback and who is running back/receiver between every play. You can shed tackles by rotating the control stick. No field goals or punts? Nope. No more acting like a tough guy by choosing to go for it on 4th down. Now you HAVE to go for it on 4th down. Come up short, and it’s a turnover on downs. No field goals either, even if you’re in range on 4th down or the end of a half. It’s endzone or bust. Scoring: With no field goals, there are only 3 ways to score: 6 points for touchdowns, and a chance at an extra point following that (no 2 point conversion option). Safeties, which are rare, but can certainly happen, get you 2 points. Kickoffs and Touchbacks: At the beginning of the game and following a score, kickoffs occur from the 20 yard line. A strength bar appears at the bottom of the screen (also used for extra points). If you strike your kick with the bar completely full, you’ll send the ball through the end zone for a touchback, causing the opposing team to bring the ball out to their own 20 yard line for their first play on offense. Anything less than a full bar, which can actually be tough to get, results in a player running the ball back with a wall of defenders in front of him. Xbox options: Before you start the game, you can select some options by pressing Y when the game is highlighted. You can change the amount of play time a virutal quarter gets you, the length of time in the 4 quarters of the game, and the difficulty of the computer from Easy to Very Hard. On Very Hard, the computer moves FAST. This is my favorite difficulty. Also, you can adjust the screen by zooming in, which is a great addition since the game’s setting is initially heavily letter-boxed, and the screen is a little hard to see until you set and save your ‘zoomed in’ feature. The ability to press a ‘jump’ button makes Tecmo Bowl Arcade a blast – and makes for some spectacular catches. Where can I find this game? You can always hunt down the massive, double monitored, 4 player original arcade cabinet! That might prove difficult and expensive, however. In addition to this compiliation disc for Xbox, the game was made avaliable for download on the Wii’s Virtual Console in 2009. I don’t believe it’s been avaliable anywhere else outside of MAME emulators for your computer. Conclusion: Despite no differences in players, only 2 teams to play as, and no NFL player names, Tecmo Bowl Arcade is a wonderfully addictive game to play. Amazing in its simplicity. With the Xbox version able to save your high scores/stats, the replay value is higher than it might otherwise be. Fun even if you’re playing solo, the most excitement comes from getting 4 guys together who love football; then, you’re in for a heck of a great time. You can kick extra points in Tecmo Bowl, but no field goals. Every possession is a 4 down, touchdown-or- bust possession! This entry was posted in Arcade - Tecmo Bowl and tagged Tecmo Bowl Arcade Review. Bookmark the permalink.